by Rohall, David E.; Milkie, Melissa A.; Lucas, Jeffrey W.
Details the contributions of sociology to the field of psychology. Written by a team of sociologist, Social Psychology: Sociological Perspectives, 3/e introduces readers to social psychology by focusing on the contributions of sociology to the field of social psychology. 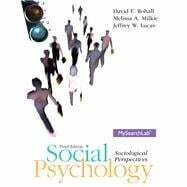 The text discusses the field of sociological social psychology in terms of its three major dimensions: symbolic interactionism, social structure and personality, and group processes. Within each chapter, each major topic is examined from each of these perspectives. This text is available in a variety of formats – digital and print. Pearson offers its titles on the devices students love through CourseSmart, Amazon, and more. To learn more about our programs, pricing options and customization, click the Choices tab. Identify the contributions of sociology to the field of psychology. Discuss the field of sociological social psychology in terms of its three major dimensions: symbolic interactionism, social structure and personality, and group processes. David Rohall (de-rohall@wiu.edu), received his Ph.D. in 2000 from University of Maryland-College Park, and is now Associate Professor of Sociology at Western Illinois University. In addition to general courses in sociology, Dr. Rohall teaches courses in sociological social psychology, identity, and socialization. His primary research interests lie within the social structure and personality perspective, including the study of how social structural conditions impact individuals' sense of self and their attitudes and beliefs about the world. Melissa A. Milkie (mmilkie@socy.umd.edu) received her Ph.D. in 1995 from Indiana University, and is currently Professor of Sociology at the University of Maryland-College Park. Her primary research interests, often framed within a symbolic interactionist perspective, include examining how cultural ideals related to dimensions of stratification like gender, race, and social class influence the self-concept and mental health. Much of her recent work examines family and school contexts of children’s and adults’ mental health. Jeffrey W. Lucas (jlucas@socy.umd.edu) received his Ph.D. in 2000 from the University of Iowa and is now Associate Professor of Sociology at the University of Maryland-College Park. His primary research interest, centrally located within the group processes perspective, is the experimental analysis of theories of basic social processes.